Congratulations to Institut Curie for the great work. The research article recently published in Nature Communications entitled “Outlier response to anti-PD1 in uveal melanoma reveals germline MBD4 mutations in hypermutated tumors” may explain the unexpected response to immune checkpoint inhibitors in a few UM patients, opening the door to further clinical research to treat patients with MBD4-deficient tumors. This case-report study identifies a patient with an unusual sensitivity to a programmed death protein 1 (PD-1) inhibitor, a pharmacological agent that relieves the immune suppression that occurs in certain types of cancer and prevents immune cells from attacking the growing tumor. This therapy belongs to a family of frontline drugs being implemented in cancer immunotherapy, working by boosting the patients’ immune system, allowing it to target and kill cancer cells. This sensitivity to a PD-1 inhibitor was associated with other genetic mutations (changes in the DNA), including germline and somatic mutations — that is, respectively, mutations a patient is born with (and that may be passed down to subsequent generations), or mutations that a patient may develop after birth — in a gene encoding the Methyl-CpG-binding domain protein 4 (the MBD4 gene). This study looked at the responses of 42 metastatic UM patients, and more specifically at one outlier patient who achieved an unusual complete response of known metastases with the PD-1 inhibitor pembrolizumab after having developed metastatic UM in the liver, lung and bone, and appearing to do so through stimulation of existing cell-mediated immunity against the UM tumor. “The identification of two UM cases with MBD4 germline mutations is intriguing, and possibly related to the frequent monosomy 3—where MBD4 is located—in this disease. Integrating our institutional cohort and the TCGA UM cohort, MBD4 germline deleterious mutations were present in 2% of UM patients (2 out of 102)”. Additional genetic analysis of the patient´s liver metastases — by whole-exome sequencing, where all the sections of the genome coding for a protein are sequenced — revealed somatic GNAQ and BAP1 mutations, as well as monosomy 3, genetic changes and a chromosome loss common in high risk uveal melanoma patient tumors. You can find a link for the full paper here. • Uveal melanoma has one of the lowest mutation burden among adult tumors. • Inactivation of BAP1 (3p21), through both deleterious mutations and monosomy 3, is frequent in UM and is associated with a high risk of metastasis. • Programmed cell death protein 1 inhibitors (PD1inh), a class of immune checkpoint inhibitors, have been evaluated in UM with low overall response rates. • This study suggests that this MBD4-related hypermutated phenotype may explain the unexpected response to immune checkpoint inhibitors in UM. • MBD4 inactivation may not be sufficient to initiate tumorigenesis but may play a significant role in tumor progression. 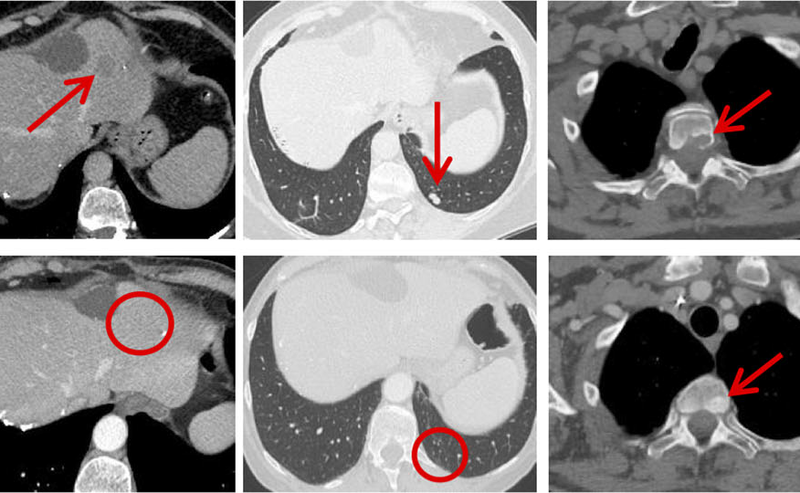 Tumors expressing this mutation appear to be clinically present earlier in life. • An ongoing MBD4-related mutagenic process might develop during tumor progression. • MBD4 germline mutations may be implied in oncogenesis and predisposition to UM.